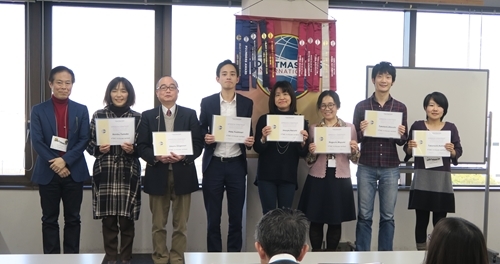 The Toastmasters Club Area 52 International Speech Contest was held on March 2, 2019, at Noge-chiku Center near JR Sakuragi-cho station. 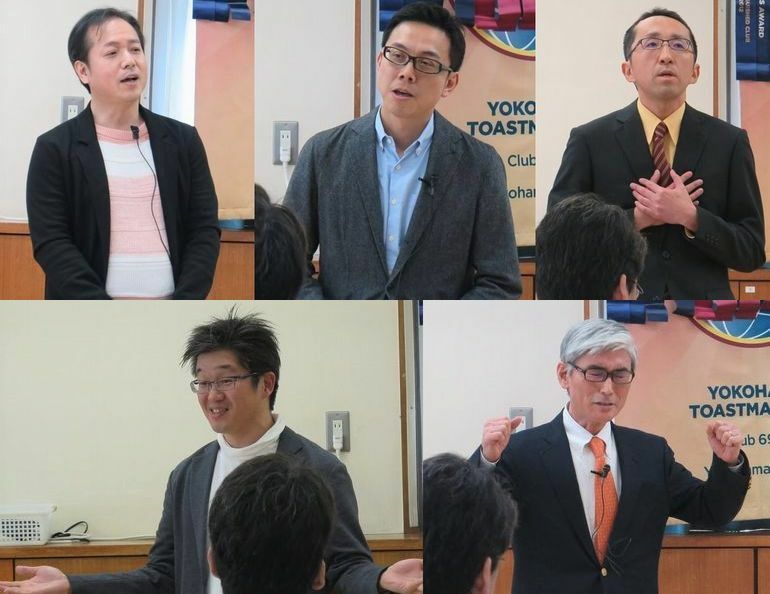 This contest precedes the Toastmasters International Speech Contest which is held annually in summer. The winners of each club compete at respective Area Contest, then the winners there again proceed to Division Contests. 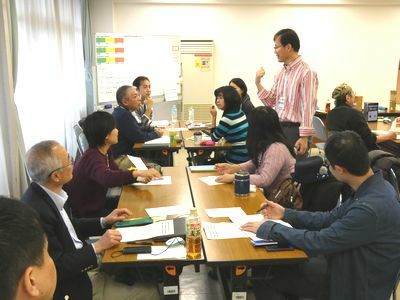 The Division Contest winners will compete at the District (All Japan) Contest in May, and then the winner of the District Contest will go to the World Championship in summer. 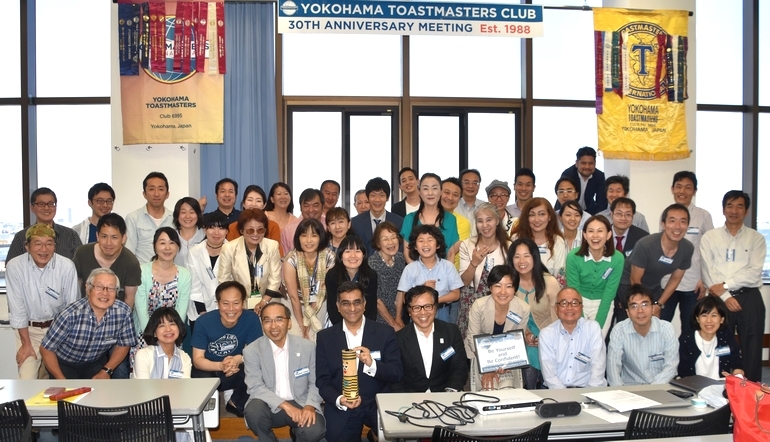 Each club that belongs to an Area is required to host an Area Contest in turn annually, and our Yokohama Toastmasters Club co-hosted the Area 52 Contest this year with a Japanese club, Kannai Toastmasters Club. In this contest, we had special features that we’d never had before. One is that we were required to take off shoes and wear slippers inside a venue. I’d never seen contestants making speeches in slippers and it was a novel sight to behold. I assume they might have had difficulty moving on the floor. The other thing was that a piano performance accompanied the contest. There happened to be a piano in the venue and it was free to use it. Luckily and coincidentally, we had a pianist within our members who happened to be there! So, I asked him to play it at an opening and award presentation. He stroked the piano keys tenderly and “Baaang!” them when needed. His piano improvisation gave a cheerful boost to the contest, which is usually filled with tension and nervousness. Thank you, TM K.K. for playing it on the spot! Following the cheerful “Baaang” of piano came the contest opening. First, the English Contest began at 13:15, and I, TM T.S., facilitated it as Contest Chair and MC. 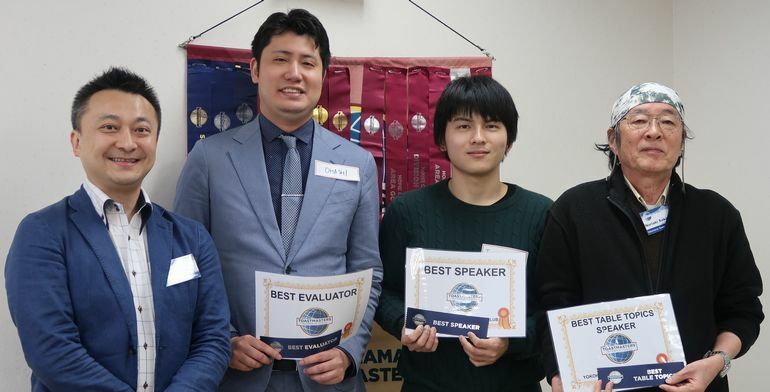 The venue was packed with almost 70 Toastmasters from all clubs that belong to Area 52 (Yokohama, Kannai, Minatomirai and Yokohama Ocean TMC), and six contestants started to compete with each other. 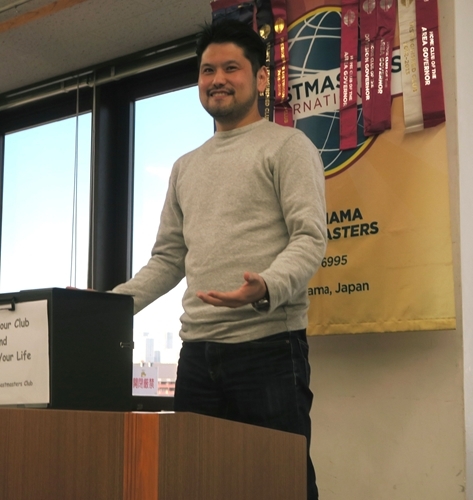 The first speaker was our Yokohama TMC’s president, TM F. Although it must have been nerve-wrecking to speak first at the contest, he delivered his speech marvelously with confidence. 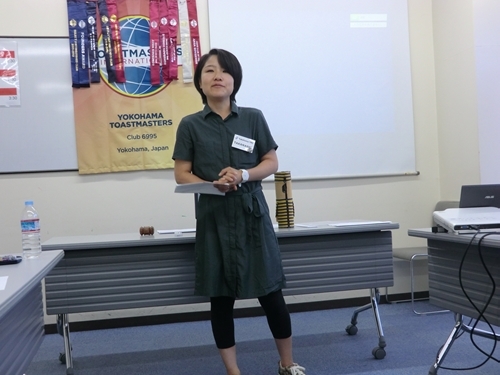 The second speaker was TM H., who was an experienced speaker representing Yokohama Ocean TMC. She had been a finalist at the District Contest before and she delivered her speech with excellent vocal variety, gestures and refined skills. The third speaker was TM A. from Minatomirai TMC. 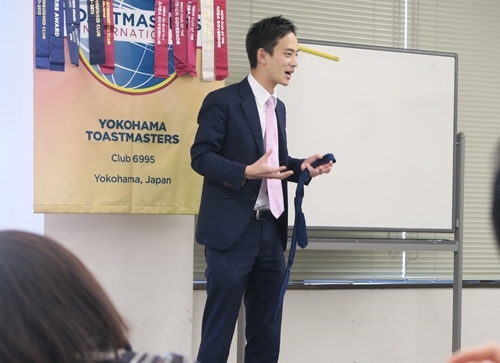 Although his experience as a Toastmaster is short, he is a great speaker who has participated in contests many times before. As though to prove it, he rendered his speech with sophistication and smartness. 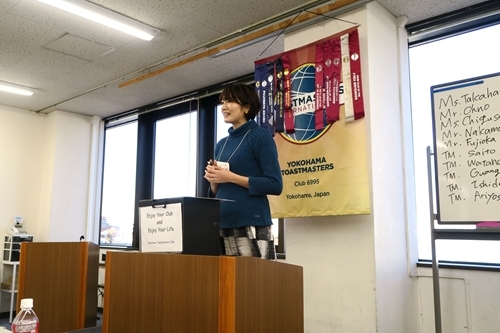 The forth speaker was TM K. who was representing Yokohama Ocean TMC. Taking advantage of his height, he spread his long arms like an eagle and towered over us, and delivered a unique story. 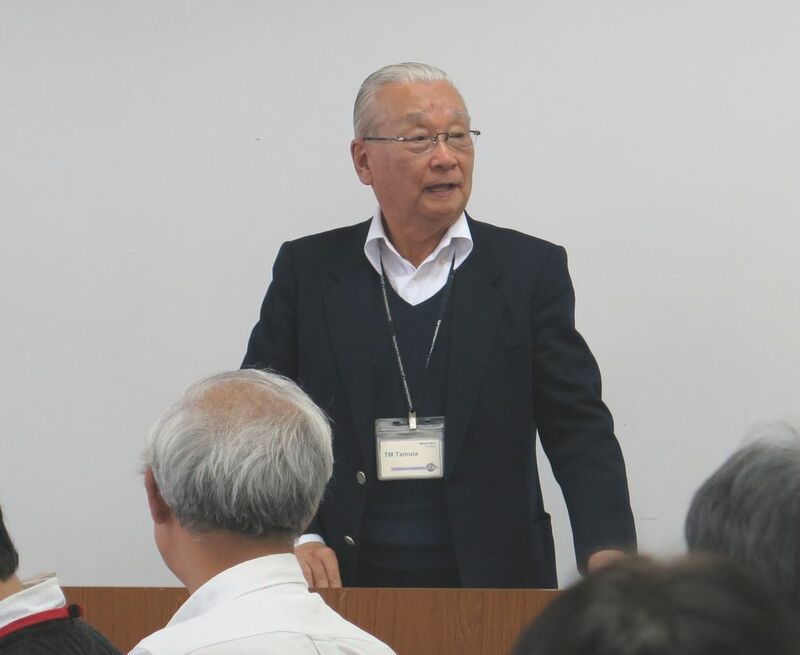 The fifth speaker was TM O. who represented Yokohama TMC. He has an innate talent to bring smiles to anyone who sees him. He used his magic onto the audience and delivered a cheerful speech that left us all smiling and happy. The sixth and final speaker was TM O. from Minatomirai TMC. 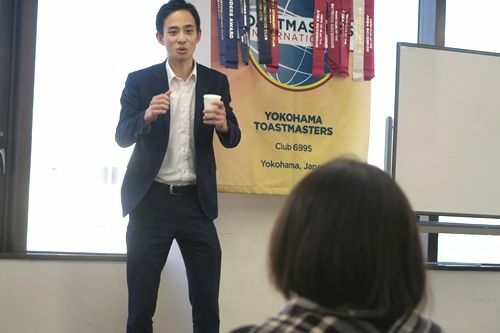 He has a long-term experience as a Toastmaster and delivered his speech in fluent English with prominent speaking skills. 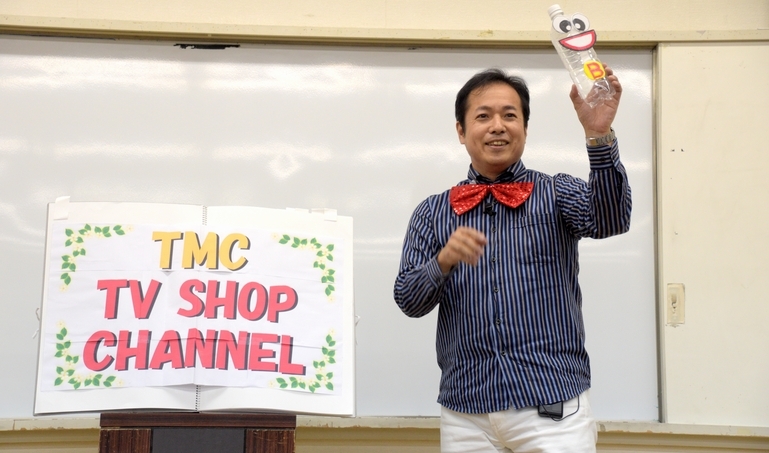 While tally counters were tabulating judges’ results, TM S. from Minatomirai TMC interviewed the contestants with his humorous talk and entertained the audience. An experienced Toastmaster as he is, he improvised the question after question and sometimes brought contestants to their wits’ end. I received the judges’ result from Chief Judge and finally commenced on the award presentation. Unfortunately, one contestant out of six went overtime and became disqualified. Therefore, winners were selected from remaining five contestants. 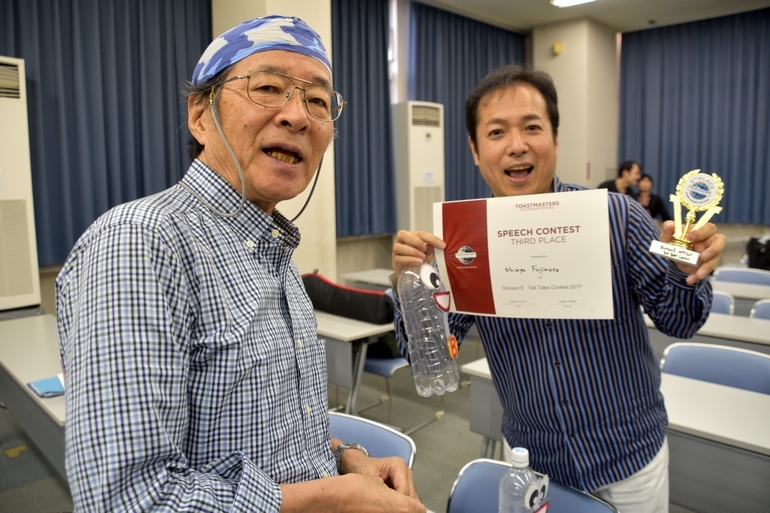 The third place winner was TM F., who was representing our Yokohama TMC and courageously made the first speech. 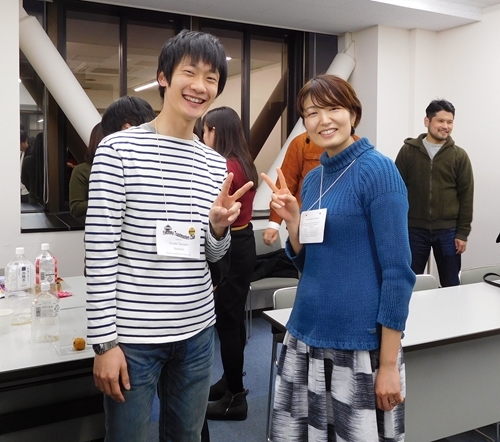 The second place winner was TM H. from Yokohama Ocean TMC, and the glorious first place winner was revealed to be TM A. from Minatomirai TMC who delivered a highly sophisticated speech. Congratulations all winners! After the intermission, the latter half of the contest, which was the Japanese Speech Contest, began. 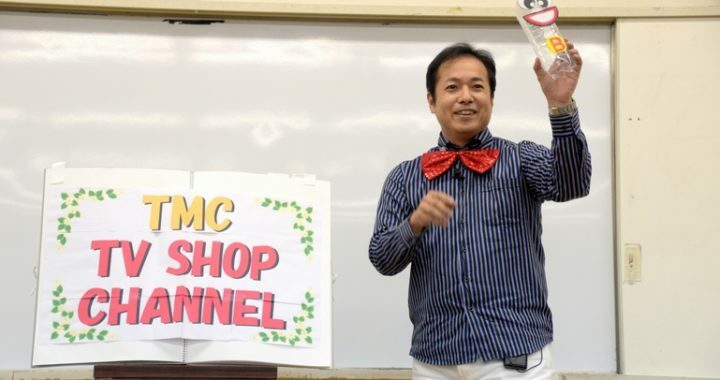 It was hosted by Kannai TMC and facilitated by the first-time Contest Chair, TM T. Neatly adorned in business suits, he played the role of MC smoothly and solemnly. Japanese Contest proceeded just as the English Contest did. It started with opening remarks, then the rule explanation was given, and the speech competition began. The first speaker was TM K. from Yokohama Ocean TMC. She was given a ticket to this contest a week prior to it, and gave a refreshing speech with a shy smile. 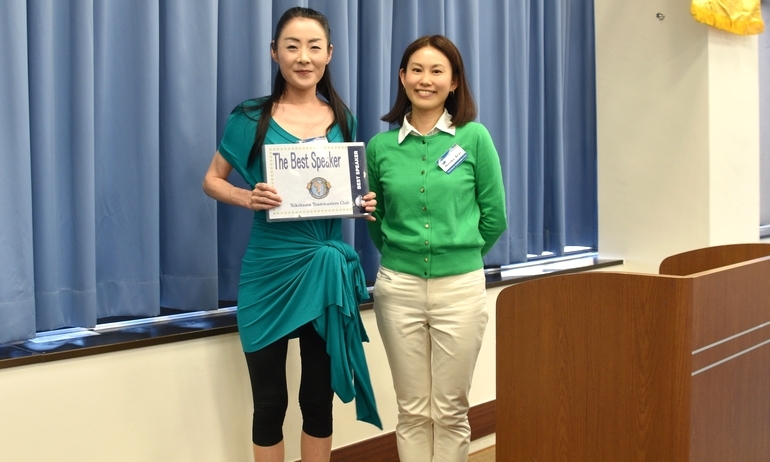 The second speaker was TM F. from Yokohama TMC, who had won the third place award in the English Contest. Isn’t it amazing that he participated in the two contests at the same time? With renewed confidence attained by his third place prize, he delivered his speech marvelously. 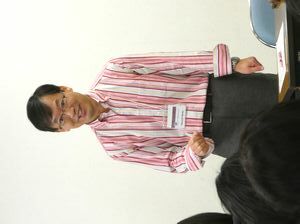 The third speaker was TM A from Yokohama Ocean TMC. With his signature big voice that doesn’t require microphone’s help, he rendered his speech with refined gestures and movements. 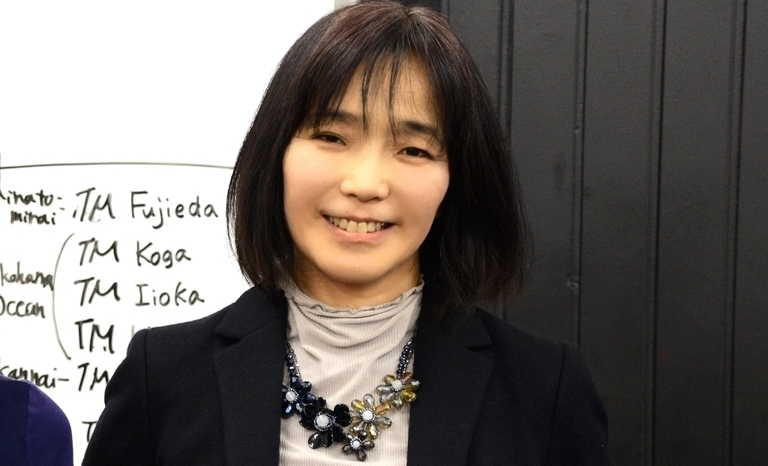 The fourth speaker was TM T. representing Minatomirai TMC. 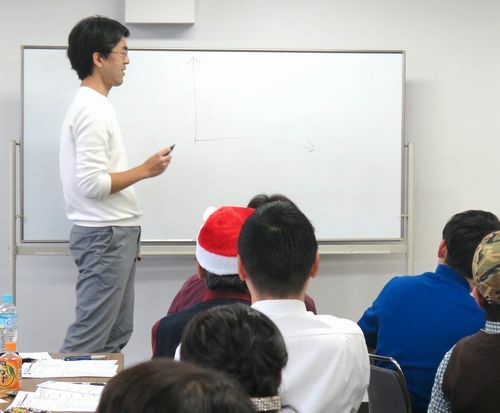 He grew up in the U.S. and speaks English like a native speaker, and I’d never heard him making speeches in Japanese. But I found out for the first time that he could speak Japanese fluently as well! In his native tongue, he delivered his speech humorously. 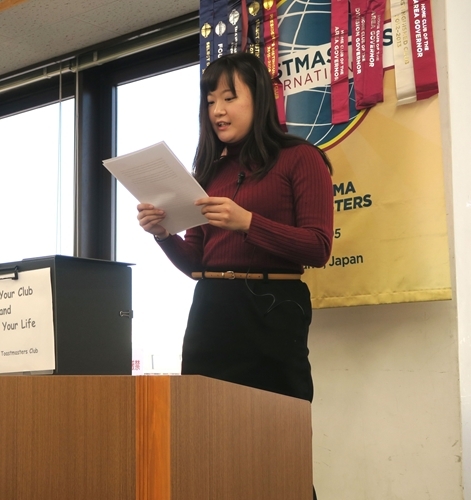 The fifth and final speaker was one of our representatives, TM A. from Yokohama TMC, who talked candidly and sincerely about her poignant experience in her youth. 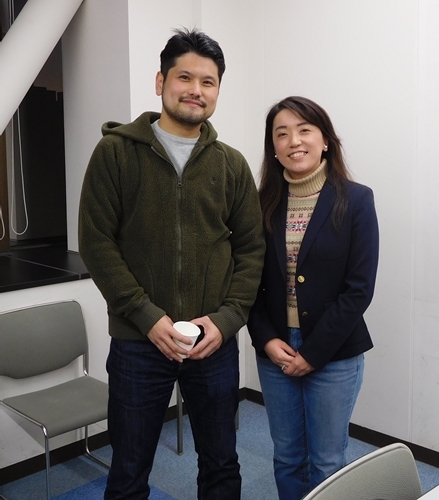 The Japanese Interview Session was conducted by TM I. from Yokohama Ocean TMC, who is also an Area 54 Director. It was a cheerful session in which relaxed contestants answered questions with big smiles. さて、日本語コンテストの結果は…なんと! 1位が我らがプレジデント、横浜TMCのTM F、2位も横浜TMCのTM A、そして3位がオーシャンTMCのTM Aでした。我が横浜クラブ、ダブル受賞で、TM F.は英語コンテストでも3位入賞でしたから、なんとトリプル受賞ですね! おめでとうございます! 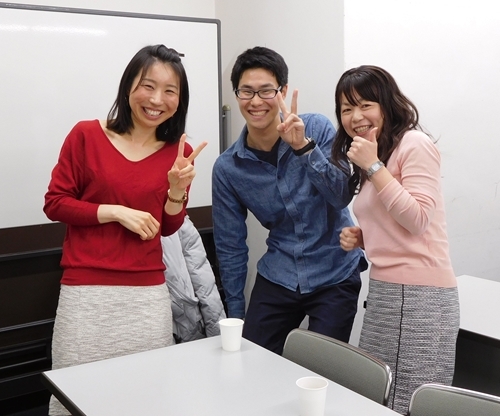 Following the fun Interview Session, the winners of the Japanese Speech Contest were announced. And guess what? 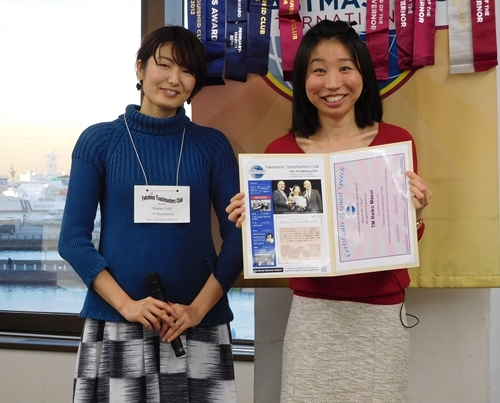 Our president, TM F. of Yokohama TMC, won the first place! And the second place went to TM. A from our club as well! 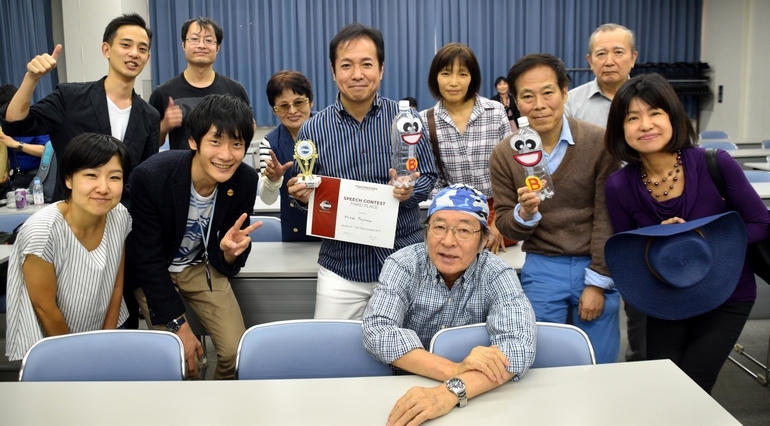 The third place award was given to TM A from Yokohama Ocean TMC. 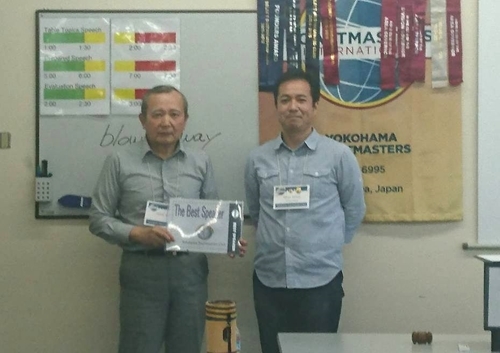 Since our president TM F. received two prizes and TM A. received one, our Yokohama TMC won the three prizes in the contest it hosted. What a great achievement! Congratulations winners! 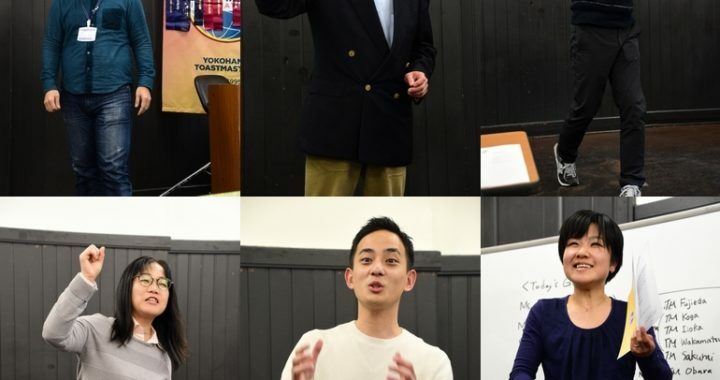 One thing I learned in this contest was the power of Toastmasters’ teamwork. Those who had roles to play worked on their own accord without specific instructions. Many volunteers helped setting up the venue without coercion. I can proudly say that everybody, including committee members, contestants and audience, enjoyed the contest thoroughly and it was a great success. Thanks everyone for your cooperation! The two first-place winners, TM A. and TM F., I wish you a big success in the upcoming Division E Contest next month. I’ll be looking forward to hearing your speeches again there! 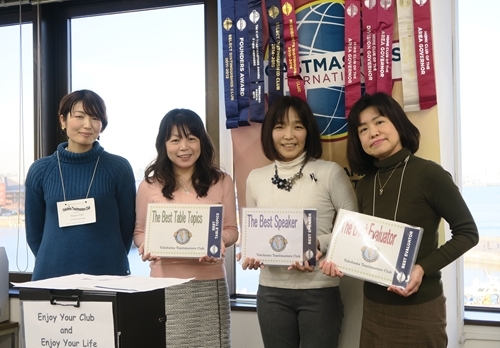 The last meeting of Yokohama Toastmasters Club in 2018 was the special workshop named “Table Topics Boor Camp” held on Dec. 15. 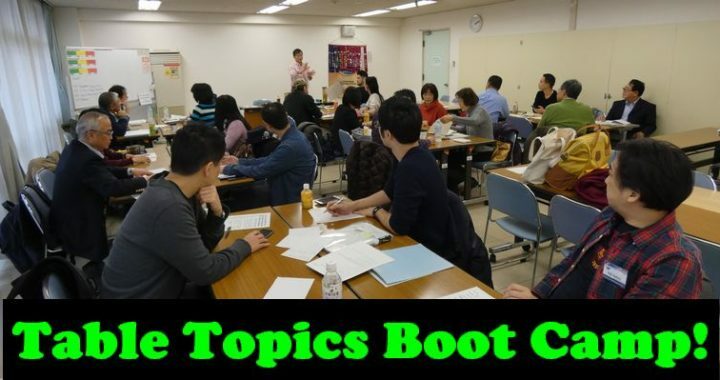 “Table Topics” is an impromptu speech session in which randomly pointed members make a short speech for one or two minutes for various questions from the topic master. At a regular meeting, we have Table Topics session for twenty to thirty minutes, and around ten members answer a question without preparation. It is quite difficult. So we held a special workshop specific to table topics for two and a half hours in this “Table Topics Boot Camp”. 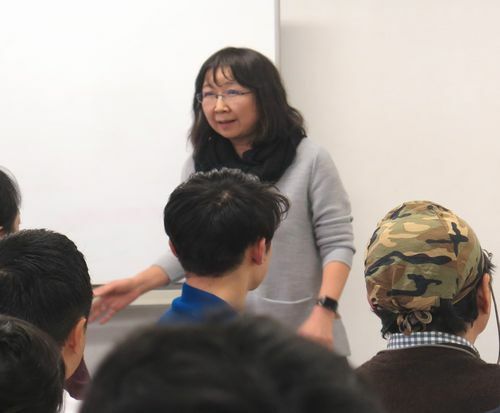 We invited TM W (Atsugi-Zama TMC) as an instructor. 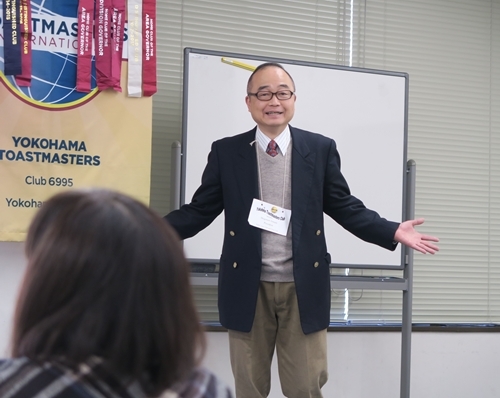 He is an English teacher at high school, won the second prize at Toastmasters International Speech Contest, has held a lot of workshop about Table Topics. First, we made a group of four people and every member made an impromptu speech in each group. We used questions that each member wrote down on paper and shuffled. Next, TM W gave us a lecture about table topics speech technique simply. Then we made a speech again in each group of four. At that time, we answered the same question as before. So we could answer better than the first time. 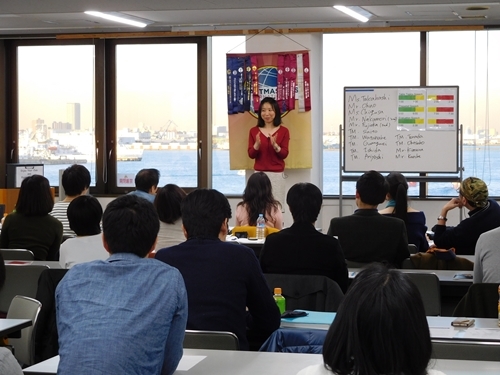 We could practice what we learned and I felt I could get the sense of table topics speech more or less. Lastly, we had a regular table topic session together. Besides, we had feedback and Q&A session and two and a half hours went by fast. In addition, TM W smiled all the time and lectured with humor. It was impressive, too. 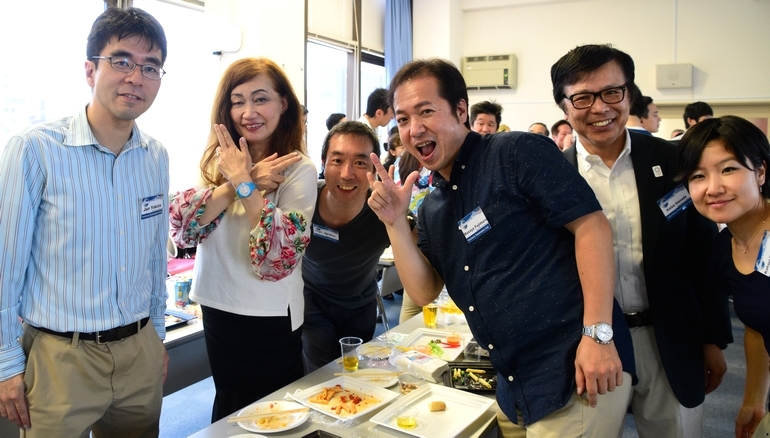 Thanks to that, I think everyone was able to relax and enjoy the workshop. Personally speaking, I was always nervous at table topics session before, but this is the first time for me to have such a fun time in table topics. I’d like to make the most of what I’ve learned in the workshop, and raise the level of table topics speech little by little. Thank you everyone who participated in the workshop. And TM W, thank you so much! 3番目のスピーカーは九州、北陸のクラブに所属していたTM Sで、年の離れた旦那様との結婚生活をジェスチャー混じりに面白おかしく語り、見事ベストスピーカーに選ばれました。TM Sはこのスピーチでアドバンスト・マニュアル2冊目を終了し、ACB (Advanced Communicator Bronze)を受賞されます。おめでとうございます! 記念例会最後のスピーカーはTM N。このスピーチでCCマニュアルを完了したTM Nは、2.5年かけてやり遂げたコメントシートびっしりのマニュアルを持参して聴衆に披露し、2.5年間で彼女が学んだスキルに「DIE メッセージ (Demand / Interest / Easy)」と名付け、その内容を丁寧に語ってくれました。CCマニュアルを完了した彼女は、Competent Communicatorの認定証を授与されます。おめでとうございます! 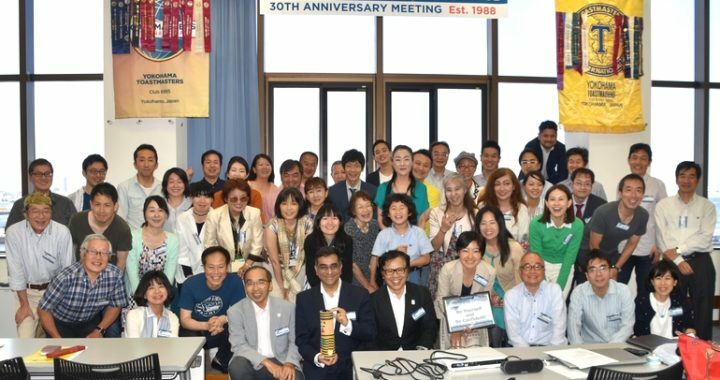 YTMC’s 30th-anniversary meeting was celebrated with over sixty attendees including the honorable guests and the former members at a spacious hall with a commanding view of the Port of Yokohama. The ceremony was taken place under the affectionate eyes of over sixty people which included founders of the club, past presidents and the guests from other clubs. 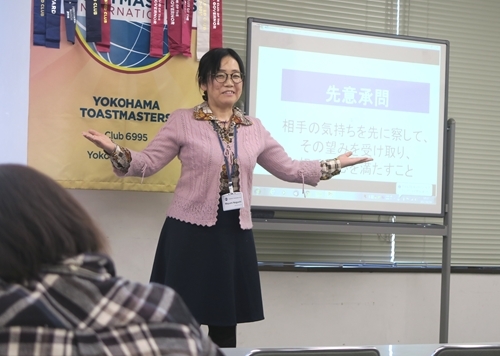 We gathered earlier than usual for a lunch party and together, we sang birthday songs and watched video messages collected from various members of Toastmasters around Japan in a festive mood. 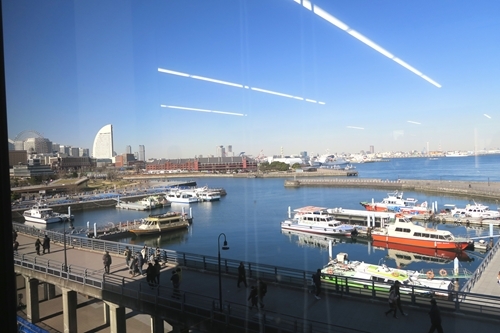 It wouldn’t be an overstatement to say that the history of Yokohama TMC is the history of District 76. Our charter members were called on the stage and shared their memories from 30 years ago. 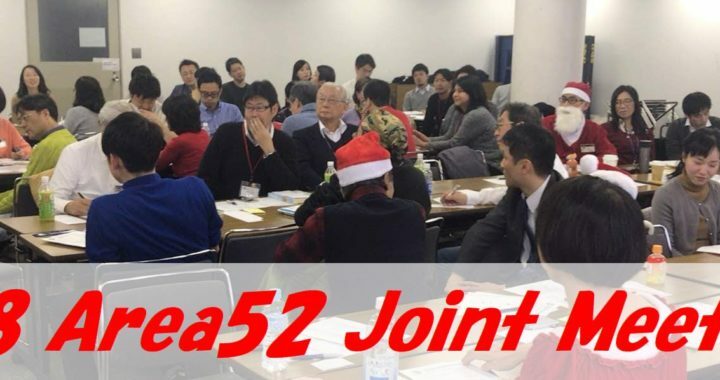 Our regular meeting #668 was observed by all the guests, which made us a bit nervous in the beginning. However, our nervousness was soon blown away by the deafening sound of Queen’s “We Will Rock You” performed by the two Table Topic Masters, who sang and danced to the music in flashy costumes. They rephrased the lyrics to “We Will Name You / We Will Respond”, and made us answer the questions. While we saw the former members trying to hide themselves, when they were called on, of course, they answered with great confidence. YTMC’s four current members presented their prepared speeches in the Prepared Speech Session. 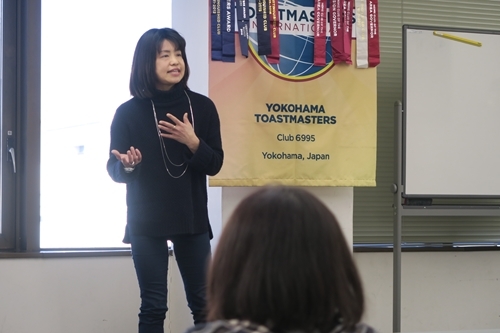 The first speaker was TM M, who is one of the newest members of our club. She volunteered to make a speech on this day without knowing it would be an anniversary meeting. While lamenting her fate, she courageously took a shot at an ice-breaking speech of the Pathways and finished it fabulously under pressure. 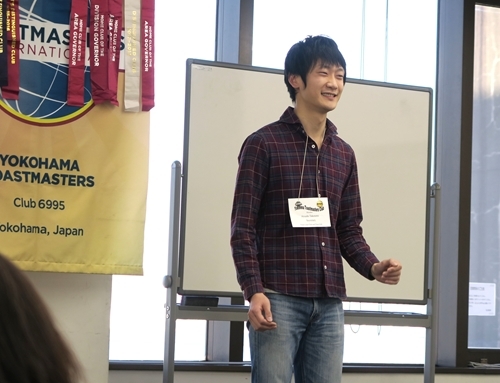 The second speaker was TM O, who used to be a member of a Toastmasters Club in Kyushu region. He also tried his first speech on Pathways on this occasion. He shared his life events with us, and one of the episodes in which he talked about his experience in participating the District Evaluation Contest that had given him confidence in life impressed me the most. 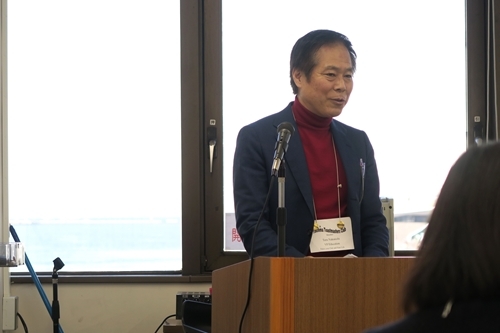 The third speech was presented by TM S, who had belonged to the clubs in Kyushu and Hokuriku regions before joining our club. 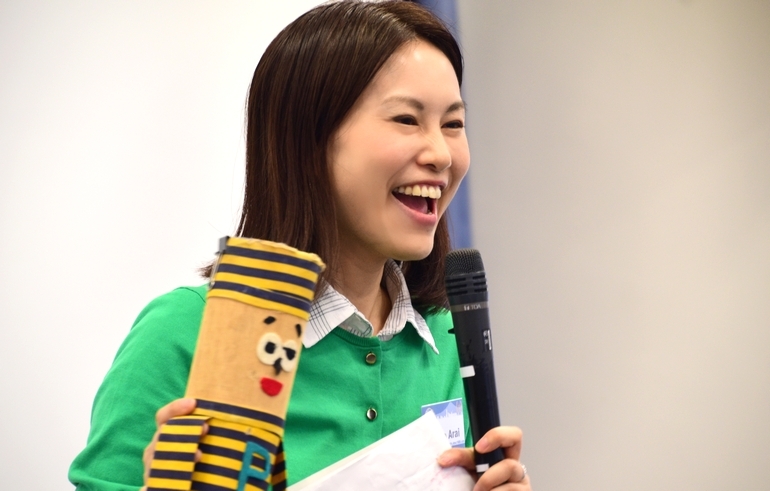 She shared with us hilarious and humorous episodes with her old husband with expressive gestures and won the Best Prepared Speaker Award. She has completed the two advanced manuals with this speech and will be given the ACB (Advanced Communicator Bronze). Congratulations! TM N presented her speech as a finale of the session. Since it was her finishing speech of CC Manual, she showed us the manual covered with so many comments slips and surprised us. 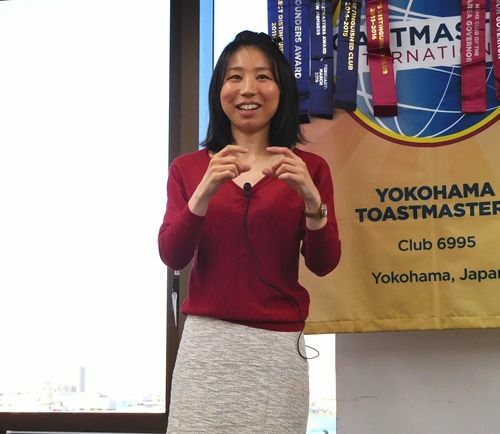 She named what she had learned in the two and half years of Toastmastering “DIE (Demand / Interest / Easy) message”, and explained the components one by one. She has completed the CC manual with this speech and will be given the Competent Communicator certificate. Congratulations! 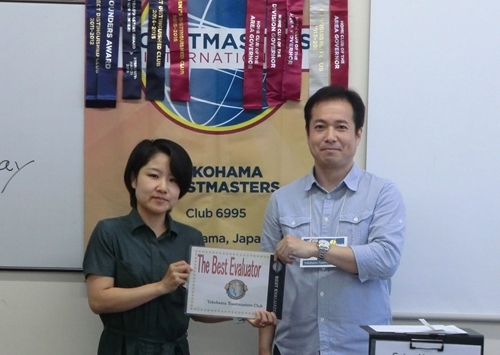 The exciting speech session was followed by the evaluation session conducted smoothly by an experienced Toastmaster I. 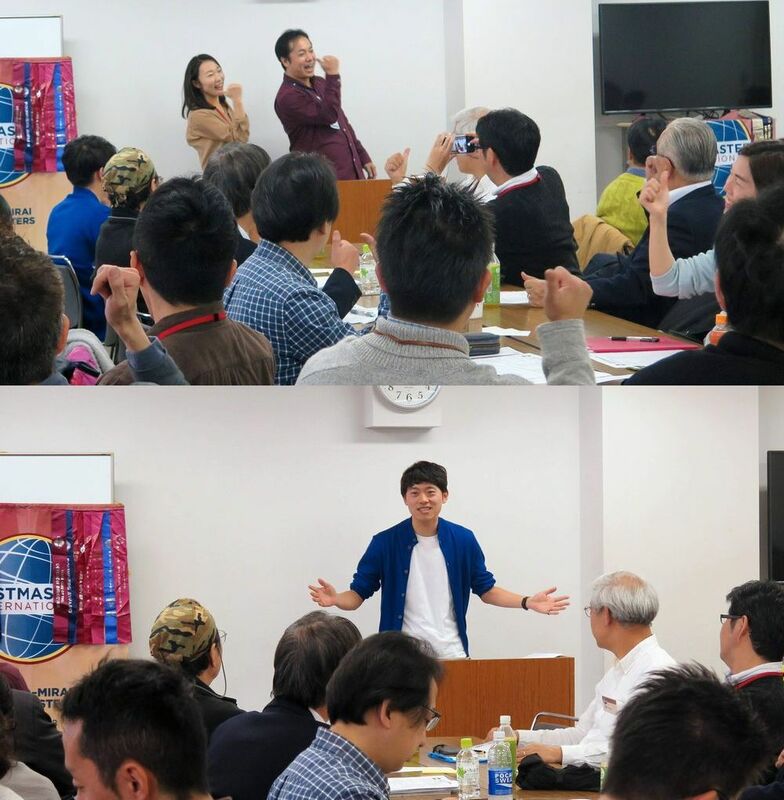 Some of the speeches were evaluated by former members, and the General Evaluator TM I commented on the good points and improvement points from our entire meeting. She emphasized that 30 years of our constant evaluation keeps improving us for the future. It was such an honor for me to take this role on this occasion. I really believe that there is Goddess residing at YTMC. She has watched us making mistakes, trying something new, and working harder again. She will continue to assist us as long as YTMC continues. Congratulations on the 30th Anniversary, YTMC!! The annual Toastmasters conferences are held in every spring and autumn, and these are good opportunities for all members of Toastmasters Club of showing the fruit of their efforts. Speakers who participate in the conference are called contestants, and anonymous judges among the audience hold the key to the outcome. The winners will be able to advance to a next stage, higher level contests. They start with the In-house contest, Area, Division, and then finally reach the International contest. 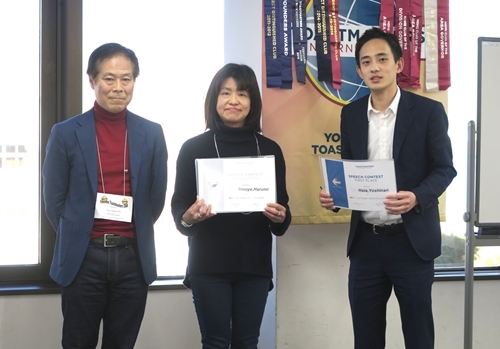 For all members of Toastmasters Club, the contest seasons are a very exciting time of the year as they are anxious to know whether their representatives can win and move up to the next level. At YTMC, we enjoyed our annual in-house contest on the last weekend. Five contestants made their speeches in English, and three contestants in Japanese. The word, SPARK!! 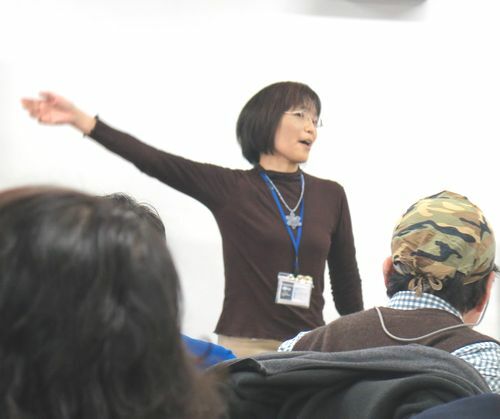 !, by the way, is the theme of this Spring Conference of the Toastmasters District 76 (Japan). Spark means a very small piece of fire that flies out of something burning and creates something new and valuable. There were so many sparks in the elaborate speeches made by the contestants, which attracted the audience throughout the show, and we had quite a fruitful in-house-contest on that day. Amazingly, two experienced members, TM T and TM H, presented themselves on the stage in both languages. Their sprits surely stimulated all members of YTMC. TM N humorously spoke about her accident at the shopping mall. TM I talked about the eternal affection he feels for his beloved wife. Last year’s champ TM F presented himself once again on the stage with an inimitable hilarious speech. TM K’s speech was suggestive and we were all inspired. Thanks to all the contestants’ elaborate speeches especially prepared for the contest, time really flied like an arrow. What a lively contest it was! Every speech was excellent and it was hard to say which one was the best of all, but that’s what a contest is for. After careful consideration, TM F and TM T (for English contest) and TM H and TM N (for Japanese contest) won the contest respectively. They are moving on to the next stage as our representatives. Congratulations!! 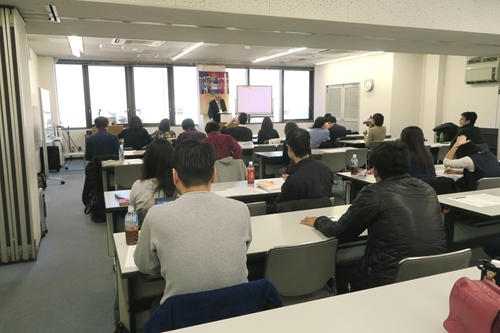 The area context will be held on March 18th (Sun) at Yaesu-Gakuen University in Takashima-cho. I’m sure you will be watching more and more sparks shine again on a stage. It would be a pity for us to miss this opportunity, so why not going there next Sunday and cheer on our sparking representatives! Lastly, I’d like to sincerely thank everyone, especially the Chief Judge TM A, VPE of YTMC who had patiently guided me through to bring this contest a success. I could not have had such a wonderful experience without your great support. I fully enjoyed the perks of the contest chair on that day. Viewing lively contestants on the stage from the side angle enabled me to feel them so close and fresh. I was really happy. 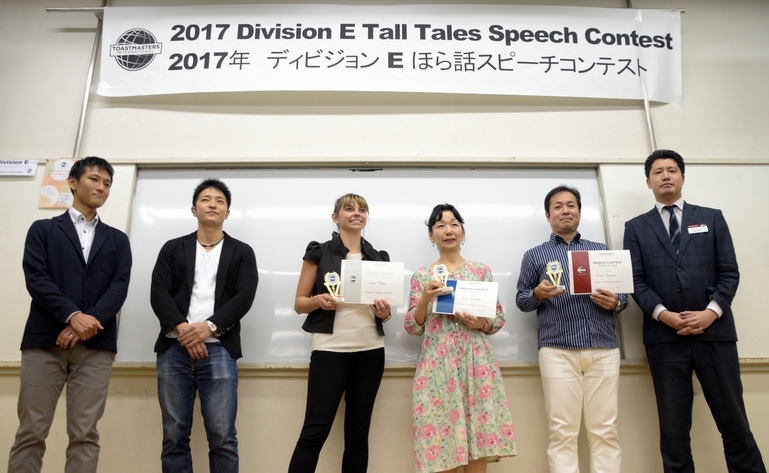 Division E Contest official photographer TM T. S.
On October 9th, 2017, Division E Tall Tales Contest in 2017 was held at the Shogai-gakushu Plaza in Kawasaki City. The winners of each Area performed the tall tales they’d created and brushed up for this day in front of more than 150 people who fully packed the hall. From Area 54 which Yokohama TMC belongs to, TM S of Kannai TMC participated in the Japanese Contest, and TM F of Yokohama TMC competed in the English Contest. First, the seven contestants competed in the Japanese Contest. Their agility in manipulating their mother tongue Japanese was quite amazing, and I was totally impressed by their virtuosity in sophisticated movements and ever-changing facial expressions. Their performance threw the house into convulsions of laughter. In the interview session after the contest, each contestant, now relaxed, revealed the curious stories about how their hilarious tall tales were made. As a result, TM M, who made up a story about a super refrigerator, won the first prize. The second prize went to TM S, a representative of Area 54 who vividly described the “Men’s Paradise” in his humorous way. The third prize was given to TM M, who comprised a wild tale in which he turned into a micro-human and sneaked into a female public bath. Their creativity took my breath away, whew. 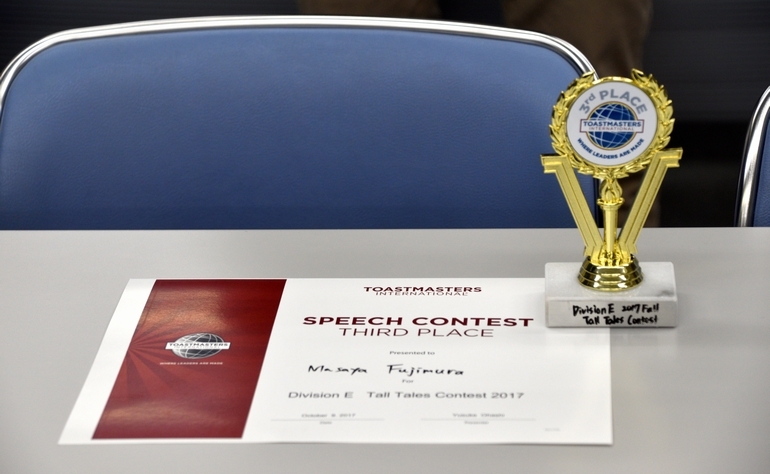 The English Contest followed the Japanese Contest. All speeches were as wonderful and amazing as Japanese speeches, and I was truly impressed by their creativity. How could they possibly create such incredulous tales? In the English Contest, TM K, who entertained and bewitched the audience by her sophisticated English and elegant movements, won the first prize and TM M, the only native speaker of all contestants, won the second prize. She talked about the adventure in Japan in which she met many comic characters on the way. And guess what? 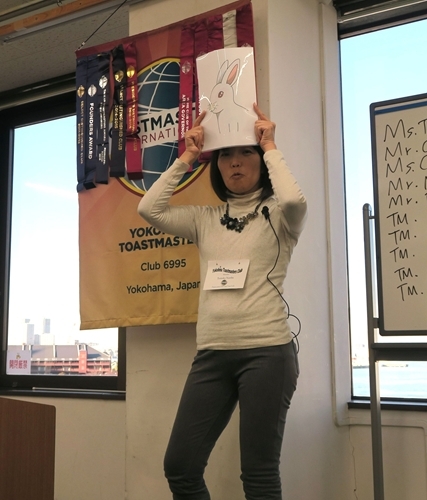 TM F from our Yokohama TMC won the third prize! He made the audience laugh out loud by his non-stop and hyper sales talk of a futuristic pet robot BOB. Congratulations TM F! The honest impression I had in this contest was that even at the Division level speakers’ skills were amazingly high. It would be quite hard to win the fierce competition like this and proceed to the District Contest. Especially, making tall tales would be tough since tall tales had to be created from a scratch to something incredulously humorous to entertain the audience. However, we, as an audience, are lucky to be able to see and laugh at the fruit of their efforts and be made happy. I enjoyed it thoroughly, too. The winners of Division E Contest, congratulations! We are looking forward to seeing your fabulous performances once again at the District Contest. 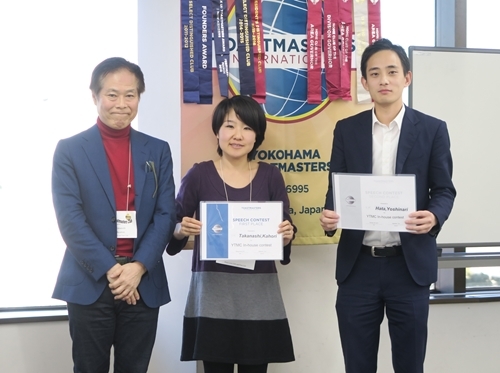 Last but not least, I’d like to thank the hosting clubs, Kannai Toastmasters Club and Visionaries Toastmasters Club, and the people in the contest management committee, for their hard work and dedication to make this contest a success. Thank you very much! 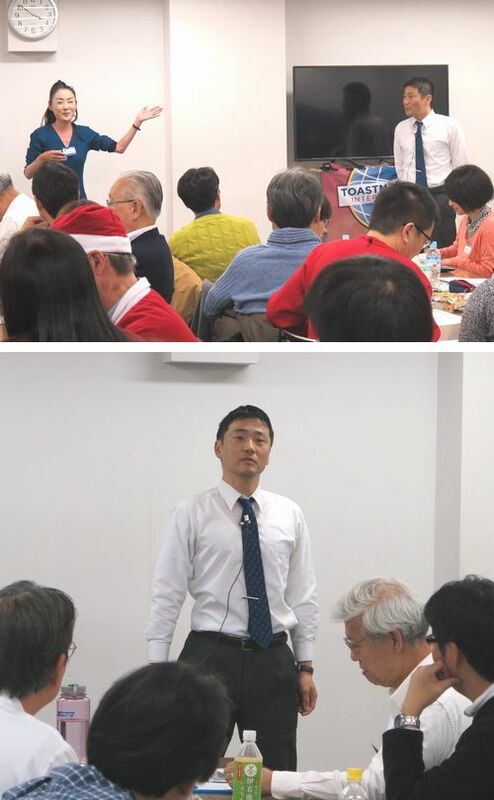 The regular meeting of Yokohama TMC was held on July 3rd. The weather was very fine, and the atmosphere of the meeting was also fine and energetic. That meeting was a little special, there was a new member’s induction ceremony and club officers’ election before the regular session. TM N joined YTMC as a new member. He seems to be so positive that he will excite YTMC more. 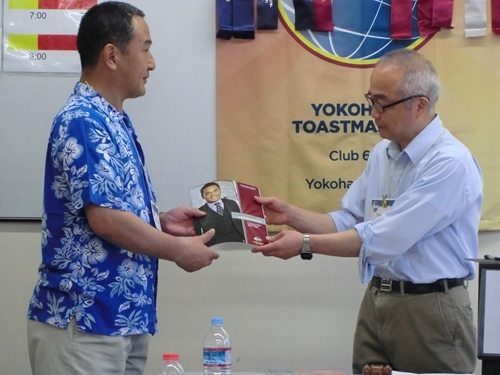 We change club officers once a year in Toastmasters Club. We elect 7 officers, and they lead the management of meetings or other events. In this election, TM T was elected as President of YTMC. I’m sure she will make our club more enjoyable, more heart-warming, and more exciting! We omitted some regular sessions due to the election, we had speech session and evaluation session mainly in the meeting. In the speech session, 4 speakers made various speeches. 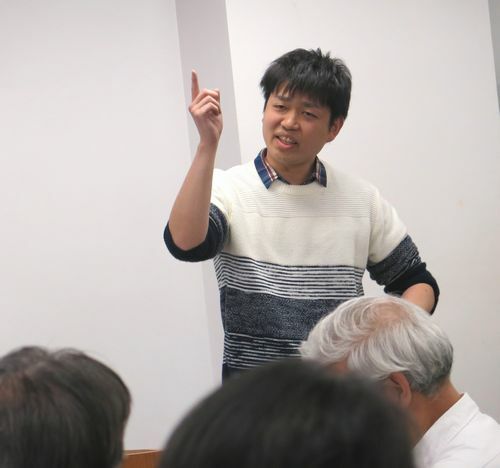 The first speaker, TM S is a new member who joined YTMC recently. He spoke about his teacher who influenced very much in his speech. TM K made a speech about how to enjoy YTMC more. He explained a lot of merits of joining drinking at English bar after meeting. TM H read a best-seller book “Who Moved My Cheese?” in his speech. He read it aloud with great feeling. The last speaker, TM I gave us a speech about Japanese comic story “Rakugo” in English. His calm tone gained more humor and every audience had a good laugh at his speech. Then we moved on to evaluation session. I think evaluation session is unique found only in Toastmasters. 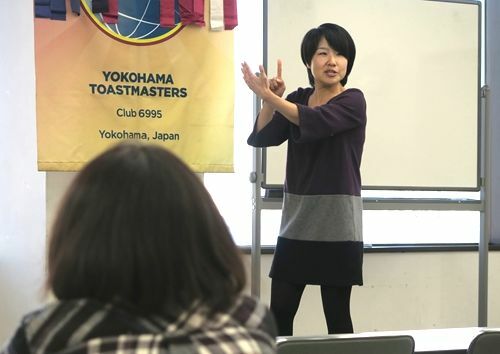 It’s rather difficult to evaluate other member’s speech, but it helps us to give speakers accurate feedback and to brash up our speech skill as well. Some member evaluated for the first time. However, everyone made typical evaluations. At the end of the meeting, we awarded a prize to the best speaker and the best evaluator, and the meeting finished successfully. It was the third time to take the role of TMOD for me. Every time, I realize that the meeting succeeds thanks to many supporters, volunteers, and helpers. So, I really appreciate great cooperation of all the member. 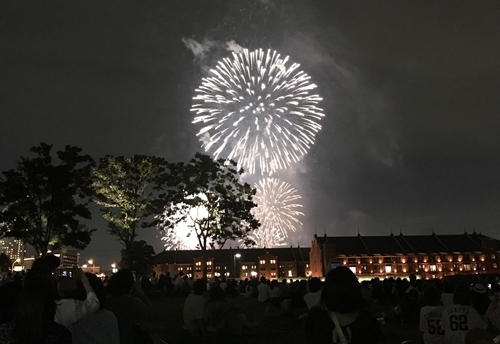 And one more thing at the day, there was fireworks watching event after the meeting. 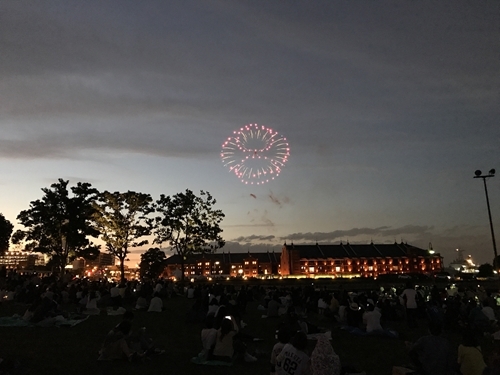 We enjoyed fireworks with drinking and relaxing on a lawn, and we got really lively! 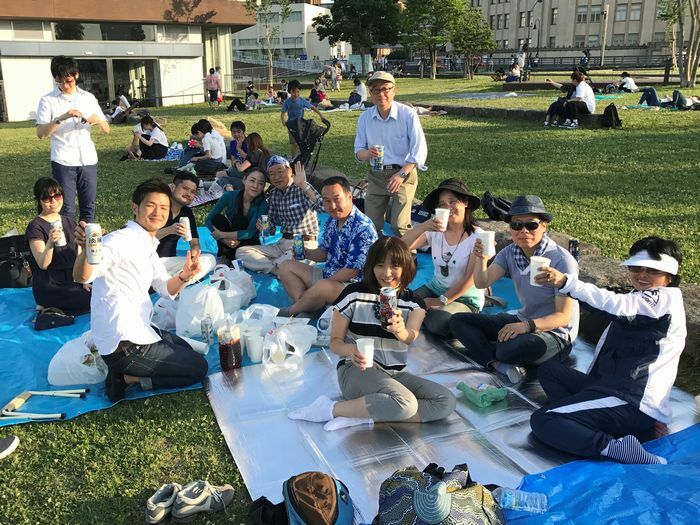 In Yokohama TMC, we plan a lot of events like this, so, we can enjoy YTMC in many ways. If you’re interested in YTMC, please try to join us as a guest! I’m TN, Club Contest Chair. I’d like to report the excitement contest result with you. 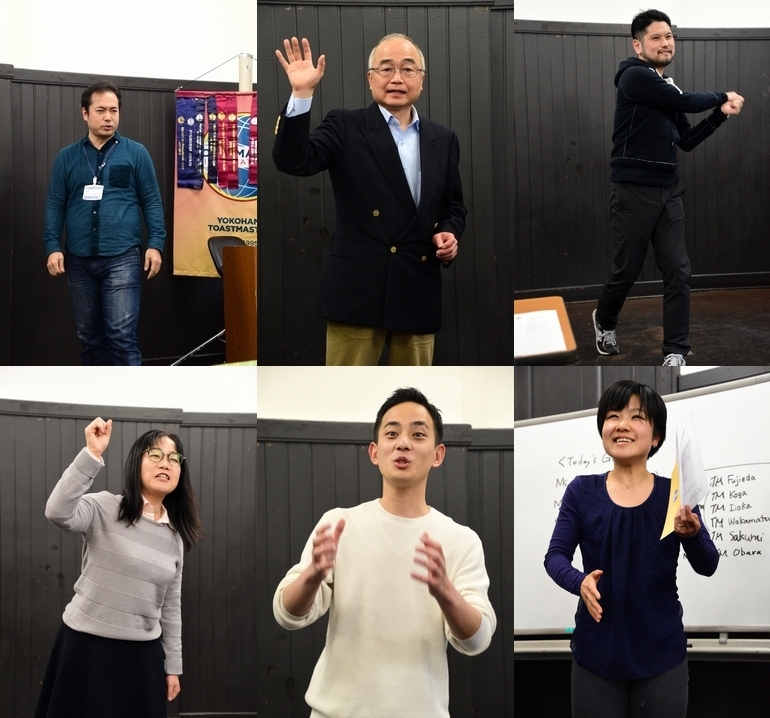 2017 International Speech Club Contest was successfully finished you’re your positive cooperation and club representatives were selected from four English contestants and four Japanese contestants after fair judge. Wonderfully, no one was disqualified from time management. TM H and TM I will represent as English contestants at Area54 Contest and TM T and TM H will represent as Japanese contestants. So let’s go to cheer them to Earth Plaza. 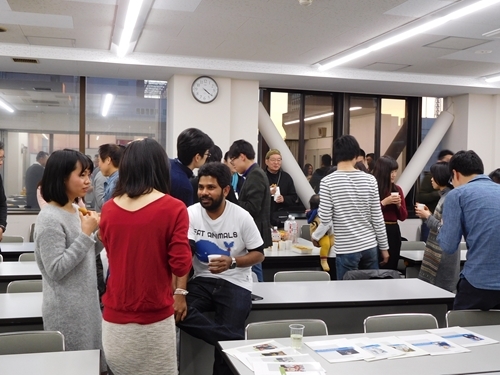 YTMC Year-End meeting was held on December 17th. 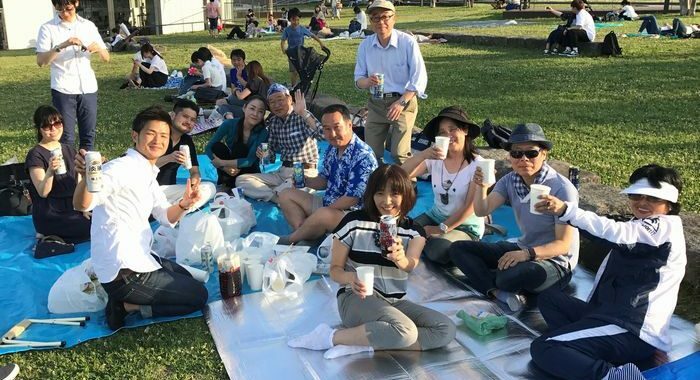 Happily, we had lots of guests including other club’s members. we invited 2016 District 76 English speech champion, TM.M! Her speech”Next!” touched our hearts, and we learned a lot from her speech and Q&A session. our joke master TM.S made us laughed hardly and made a good warm atmosphere. TM.H took the table topic role for the first time. 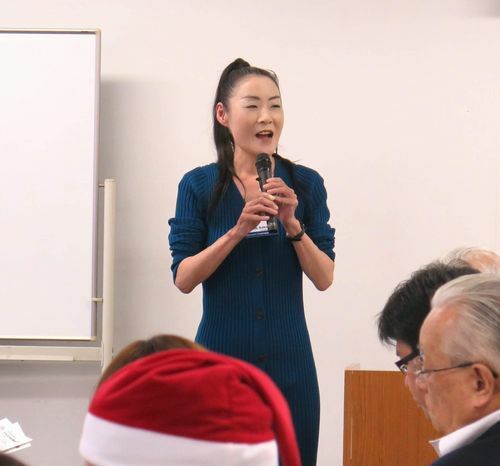 Her choices of the topics was beside the meeting theme “Look Back 2016”. 3 prepared speeches were incredible! TM.M delivered her speech for the 1st time, and she spoke about her major. Another speech talked about the service over the phone, and the last speech was about the rabbit and the turtle. All role takers including GE and evaluators did great job, and the meeting proceeded smoothly. 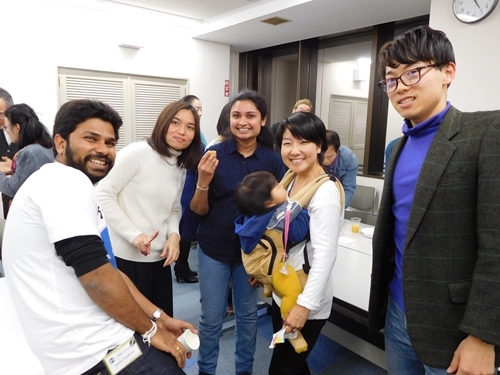 The social gathering party was also enjoyable time. We brought sweets and snacks and talked a lot with guests. 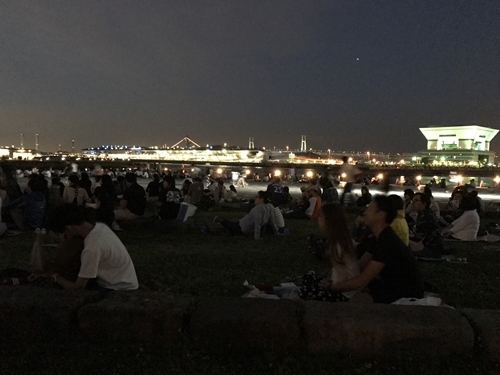 All members and guests, thank you for the great time! I hope you have great holidays!